View of “Roy Arden,” 2013. Foreground: Procession, 2013. Wall: Teenager, 2013. 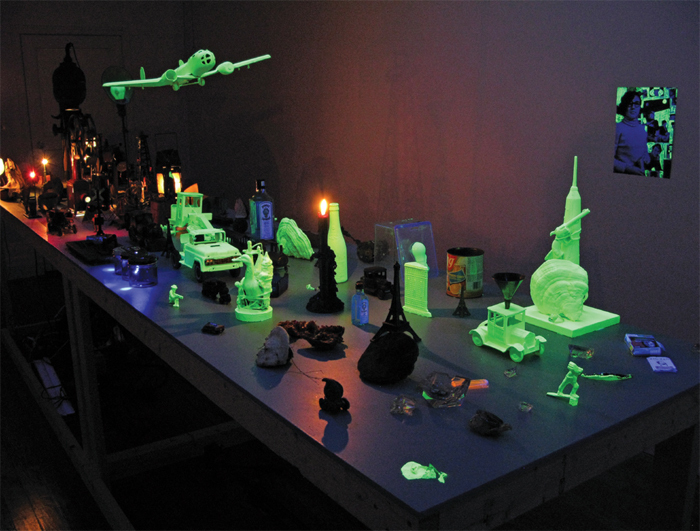 Black light was one of five different light sources used in Roy Arden’s recent exhibition at CSA Spacean arrangement of miniature sculptures, readymades, and collages, the central component of which was a long table cluttered with items and titled Procession, 2013. Many of the objects in the room, from toy figurines to bracket fungi, were colored with phosphorescent paint. Aside from the various sources of low light, the gallery was kept dark throughout the run of the show, giving the installation a chemical glow.